I’m trying to get back into sketching after a long break… this is an old one, but seems to pair well with IF’s theme this week: Tree. “Secrets are for keeping,” whispered leopard to elephant. “And so are promises,” added elephant. 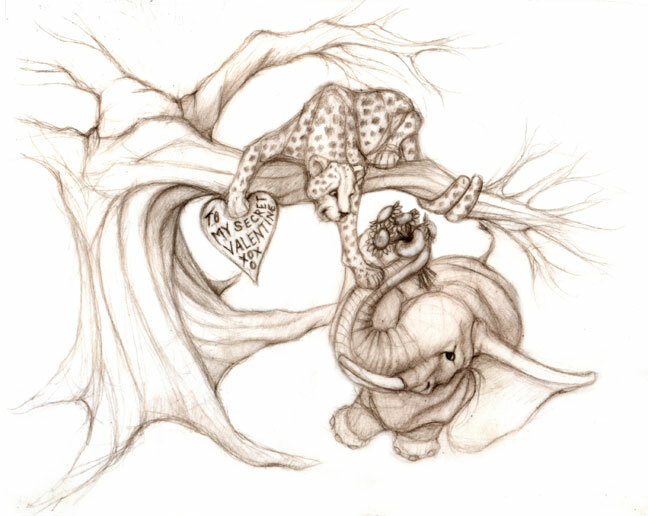 “I promise never to hunt you down,” uttered leopard, while sheepishly showing elephant a Valentine. “I promise never to trample you,” trumpeted elephant, while silently passing leopard sunflowers. Secrets and promises are for keeping. Beautiful, Penny. I want it! The overhead perspective on this is really great. That is something I have struggled with. As usual, superb!